The covered porch at the back of the house has automated remote control screens that retreat into the space above the door and windows, so it can function like an open porch in good weather. Homeowner Melissa Rizzieri wanted a very simple dining room with a partial wall to define the space. 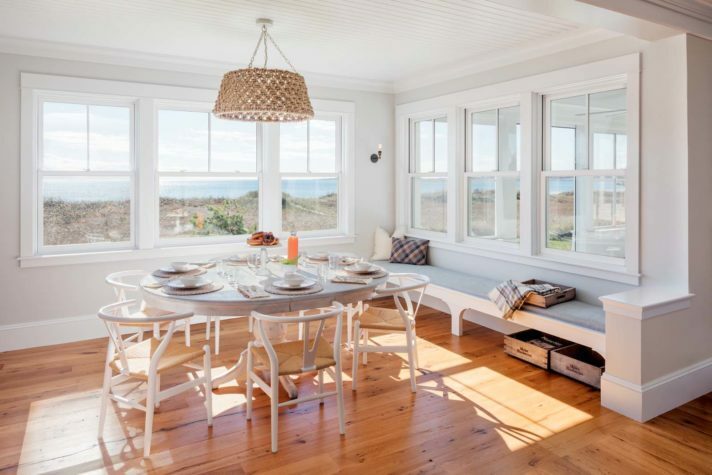 The dining table came from the Rizzieri’s previous Maine house and was refinished by interior designer Lisa Teague. The wovengrass chandelier is from Made Goods. 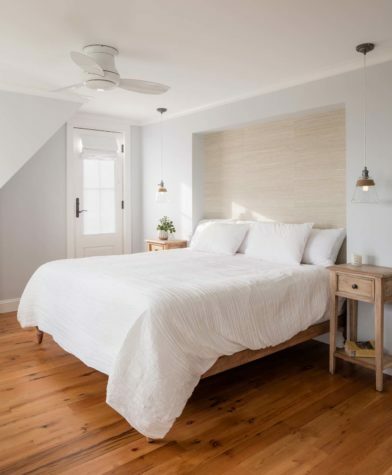 Vintage bed stands, a vintage bedspread, and a simple area rug suggest a bedroom one might find in an old Maine cottage. The storage window seats are lifted off the floor to give the built-in the appearance of having legs. A bookcase is fitted under the roofline. 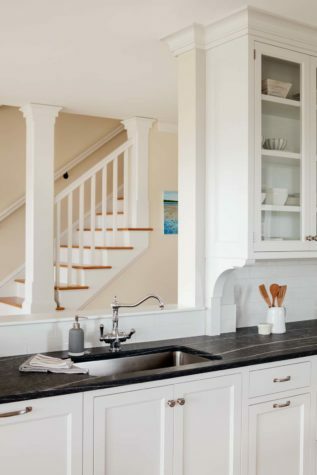 A view of the detailed kitchen trim shows how the space opens to the first-floor hallway and staircase. 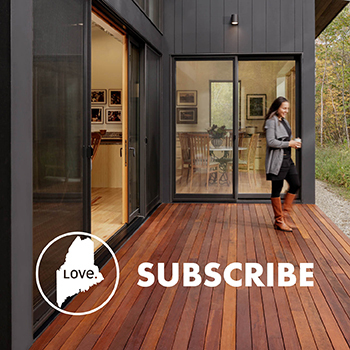 The house is clad in double-dipped gray Maibec shingles with white PVC trim and white clapboard at the front entry. The colors were inspired by the homeowners’ previous home. 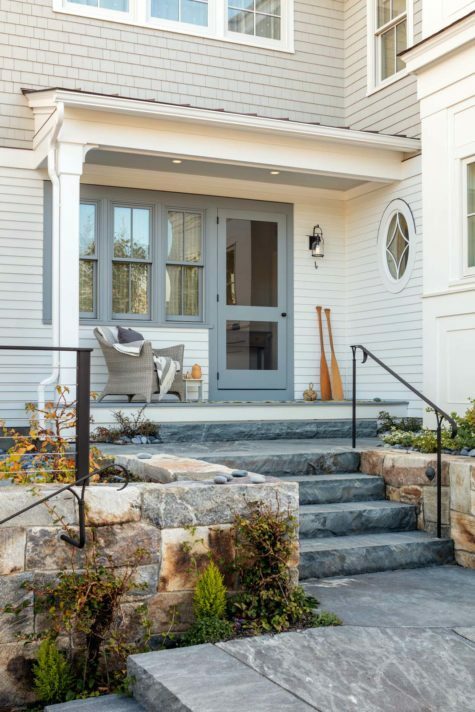 The porch and three windows to the left of the front door help “create a face to the house” and “an identity to the entrance,” says architect Brian Beaudette. A nook off the den in the “barn” portion of the house has nickelgap walls, a double daybed, and a poplar floor painted gray. It is one of the many spaces in the house intended for family or guests who want to sneak away for a nap or to read a book. The sunporch off the living room with views of the landscape designed by Ted Carter. The owners' bed is inset because of a challenge in creating the bathroom on the other side of the wall. Lisa Teague, who often likes to have a focal wall, turned the quirk into an asset, highlighting the unusual design feature with grass cloth. The pendant lamps prevent clutter on the bed stands. 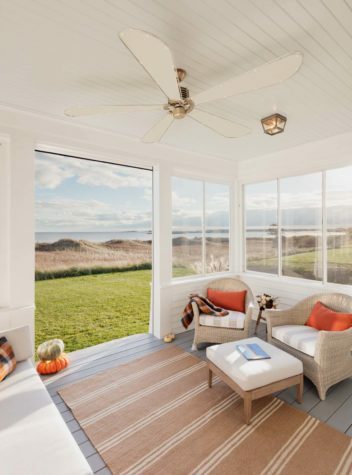 This house on Goose Rocks Beach in Kennebunkport was designed with multiple indoor and outdoor spaces. Seen here is the firstfloor sunroom with a balcony on the roof (at left), and the indoor/outdoor back porch, which has a second-floor sunroom off the owners’ bedroom. Builder, architect, interior designer, and landscape architect—they all have the same thing to say about Melissa Rizzieri: she knows what she likes. 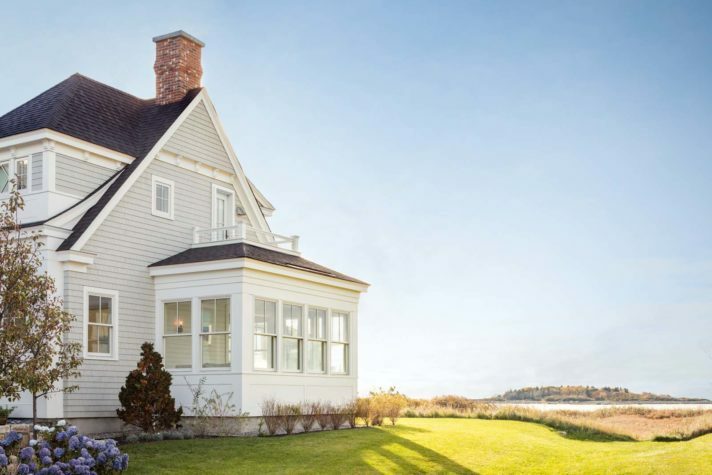 “Oh,” Melissa worries, “I must have been a pain.” On the contrary, the team that worked with her and her husband, Jerry, on the Kennebunkport house they built in 2016 adored the process. Melissa was detailed, precise, and very clear in her desires. Plus, she always brought baked goods to meetings. (Raspberry bars get mentioned more than once.) Some of what she wanted was inevitable given that the existing Cape on the property abutted Goose Rocks Beach but did not take advantage of the views. Still, as a client, Melissa was asking for more than a beautiful house that would be mindful of its location. Part of her vision simply came from how she and her family planned to use the house. Melissa is an enthusiastic baker, and Jerry loves to cook. Both love to entertain. Paramount were a large kitchen with plenty of counter space, two sinks, and a central table to integrate both sides of the kitchen—not an all-purpose island but a true work table. Melissa found a photograph online of a machinists’ table with elegantly curved metal legs that she liked. Derek Preble adapted it, building a long table with a blue de Savoie marble surface and using oak instead of metal for the base. Melissa also wanted her home to allow her frequent and plentiful overnight guests to both gather and retreat over the course of a stay. To that end, the house has the kitchen, living room, and dining room that you’d expect in a contemporary residence, as well as five en suite bedrooms, including two separated by sliding barn doors, which were targeted for the Rizzieris’ daughters. The basement, which has a polished concrete floor, holds a pool table, sitting area, and exercise equipment. Otherwise, the house is full of surprise spaces that simply don’t appear in many contemporary houses, including a foyer that segues into a generous hall and multiple exterior and interior sitting areas. A covered back porch (with remote control window and door screens that retreat into the mouldings) faces the ocean. The entry landing has a chair in which one can enjoy a cup of coffee while awaiting visitors. Both the living room and the owners’ bedroom have an adjacent sunroom. Grade challenges and coastline restrictions, not to mention the buildable footprint, presented building challenges that resulted in solutions that make the house all the more unique. The house is organized around two central corridors, one up and one down, and is divided vertically. If you are facing the house, the left side is “the barn”—not because it is a separate building but because its fenestration suggests a barn door with hayloft above, and its floors are staggered at half-level with the floors of the main house. Inside, “the barn” references an old farmhouse with nickel-gap walls and poplar floors painted gray rather than the more sophisticated furnishings and antique white oak floors used elsewhere. Stairs rise from both ends of the central corridor. A full set goes to upstairs bedrooms, and a half set leads to yet another surprise space—a den with an adjoining nook with a double daybed. 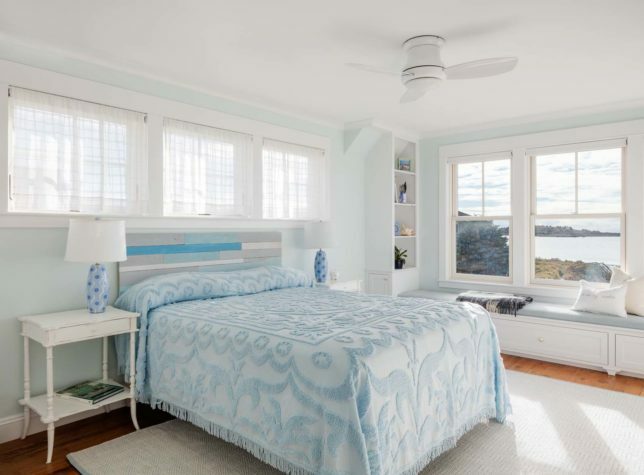 Another half-flight leads to a guest bedroom with yet another sitting room and a private balcony with views down the whole length of the beach. The Goose Rocks house was the Rizzieris’ second home in Maine. The first was a mere three blocks away. The couple moved for the opportunity to live directly on the beach, but saying goodbye to their first house was not easy. “The community was nirvana. It was Mayberry, USA,” says Melissa. Her kids grew up with idyllic summer childhoods, riding bikes and playing Capture the Flag, that would have eluded them in Manhattan, where they lived during the school year. “You’d think I was leaving Maine,” says Melissa of how traumatic she found the transition, even though she was bringing not only her family to the new house but many of her belongings, as well as Brian Beaudette, the very architect who’d designed her initial Maine home in 2000, and who had since become a friend. Melissa also carried over specific favorite features from her first house (like a gray and white exterior palette and transom windows for the dining room) and materials (including reclaimed Belgium limestone from a previous project, now used for the living room’s fireplace surround). The new players on the project were builder Geoff Bowley of Bowley Builders, landscape designer Ted Carter of Ted Carter Inspired Landscapes, and interior designer Lisa Teague of Lisa Teague Studios. Their combined efforts produced a home that suggests a sophisticated yet spare saltwater farm, a house that might have grown organically over time, given the array of spaces and finishes and the presence, in the guest rooms, of vintage nightstands, oldfashioned coverlets, and built-in bookcases under the eaves. 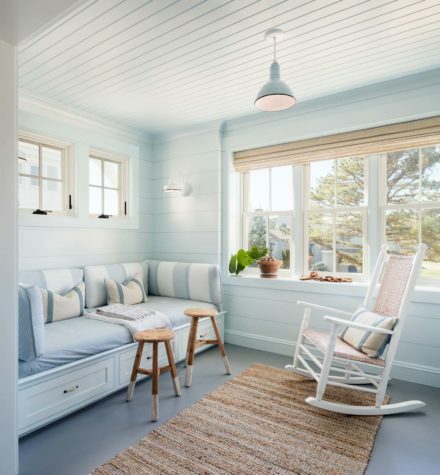 Teague minimally outfitted the rooms with textured neutrals and the lightest of ocean blues and greens for most of the house, letting the color come from the artwork, such as the paintings in the living room (one of Rizzieri and her two daughters) by Holly Irwin (of Roswell, Georgia). 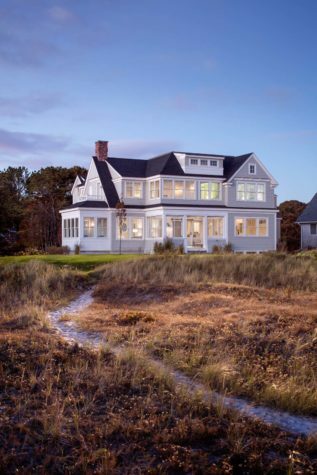 In the same way that the interior of the house has two impulses—one on the barn/cottage side, which has more color, and one on other side, which is subtler and more sophisticated—Ted Carter designed a landscape with two impulses, one to reflect the abutting dunes on the beach and another, by the front entry, to suggest an English garden. To this end, Carter used ornamental grasses, dwarf arctic willow, and butterfly bushes to create a loose, buoyant landscape on the beach side, and Hidcote lavender, Russian sage, sedum, and artemisia in the front of the house. The approach to the front door includes a partial driveway wall of New England fieldstone, which transitions into a weathered granite veneer stone by the house, all built by stonemason Herb Meyer. Steps and flatwork are of Mystic Mountain granite. The rough-edge profile of the risers and the inherent life and movement in Mystic Mountain granite (as opposed to static pebbly gray granite) are intended to create an effect reminiscent of the Maine coastline, says Carter. Lisa Teague is a master colorist with a clear sense of how pigments change in varying lights. She worked as a decorative painter in France before she began her interior design career, and she brought her painting talents to the Rizzieri job. She sanded down the bright white farm table that the Rizzieris brought from their previous home and then added layers of gray and white glaze, surrounding the table with wishbone chairs by Hans Wegner from Design Within Reach and lighting it with a round woven-grass chandelier. 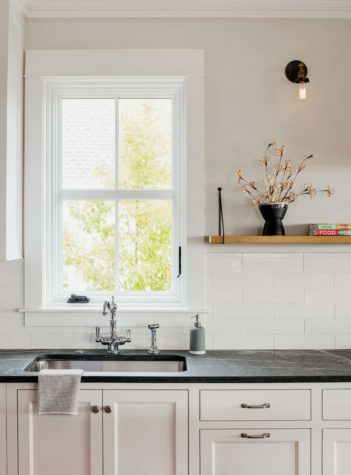 Among her visual tricks for the house: using dark Pietra marble for the perimeter kitchen counters to make the room seem larger and hanging pendant lights over the owners’ bedroom side tables to reduce nightstand clutter. Color allows you to “force the eye to see only what you want to see,” Teague says, so the modest size of the owners’ bedroom is visually offset by the darkness of a textured grass cloth she selected for the alcove that accommodates the head of the bed. To convey her vision to the design team, Melissa referenced magazine and online images and used “her magic pencil,” a term architect Brian Beaudette coined for her drawings, because she sometimes sketched complicated ideas that didn’t easily translate to real life. But, back when building began, she said to Rusty Theriault, Bowley Builders’ project manager, “You know, if this doesn’t work, let’s just bag it.” Theriault invariably responded, “I am going to make it work.” In the end, that conviction was what Melissa most appreciated about the whole team who built her home. They were able to access her dreams and translate them into reality.